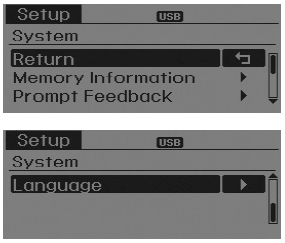 The currently used memory is displayed on the left side while the total system memory is displayed on the right side. Normal : This mode is for beginner users and provides detailed instructions during voice command operation. Expert : This mode is for expert users and omits some information during voice command operation. (When using Expert mode, guidance instructions can be heard through the [Help] or [Menu] commands. This menu is used to set the display and voice recognition language.